This post brought to you by Elmer’s ProBond Advanced. All opinions are 100% mine. A hidden jewelry organizational area! Woot woot! I call it my DIY Mirror with Hidden Jewelry Storage! 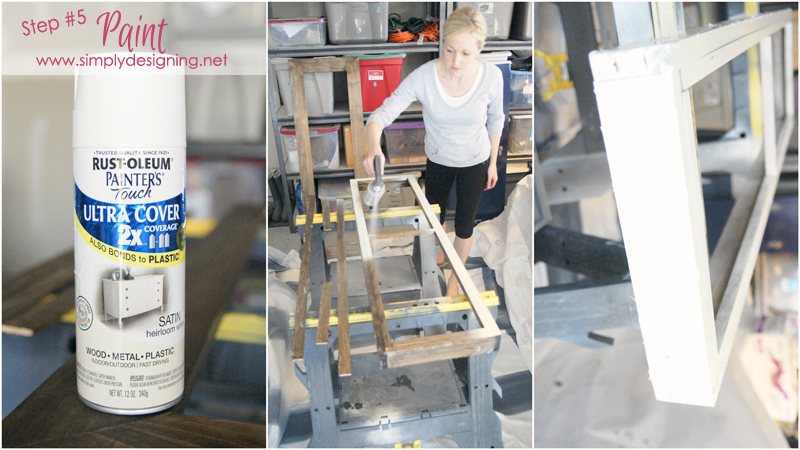 (or should it be a Chippy Paint DIY Framed Mirror with Hidden Jewelry Organization…ha! No…way too long! 🙂 Anyway, it’s my latest obsession and I love love love it! I have long since needed a full-length mirror! Yes, I leave my house in the morning without actually looking in a full-length mirror…who knows what I look like!? It’s a risk I have been taken for far too long! And let’s be honest, my jewelry has simply been thrown in a drawer…it’s a total and complete mess! 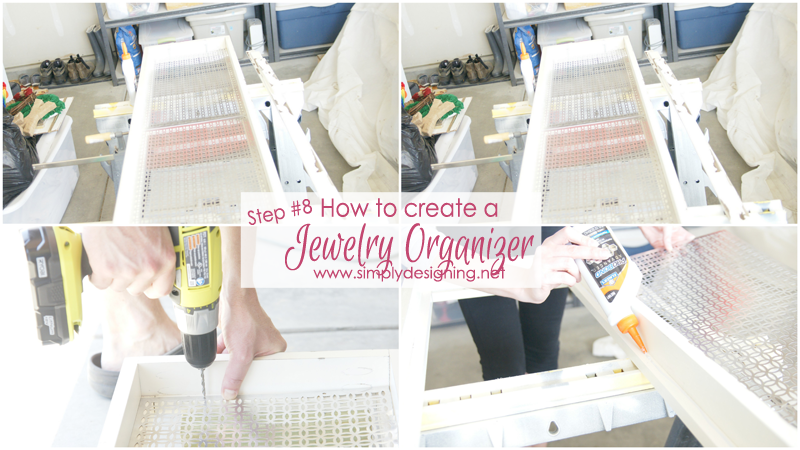 So I have been needing a way to organize my jewelry too! Over a year ago, I found a similar jewelry holder for sale and am thrilled that I finally had the chance to create my own mirror with hidden Jewelry storage that is so pretty and definitely my own style! The best part is that this cost less than half (closer to 1/3) of the cost of the one for sale. The wall in the bathroom where we chose to hang it is pretty boring but it is also the best wall in the bathroom to hang a full-length mirror since I can step far away from it to get a good view. 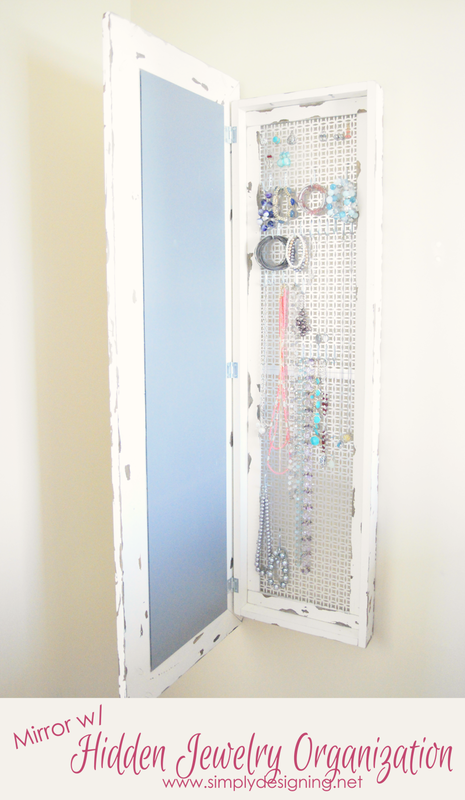 Anyway, back to my really cool DIY Mirror with Hidden Jewelry Storage…here is what you will need to make your own! To make this as simple as possible, here is my cut list. These are approximate sizes based on my mirror size! 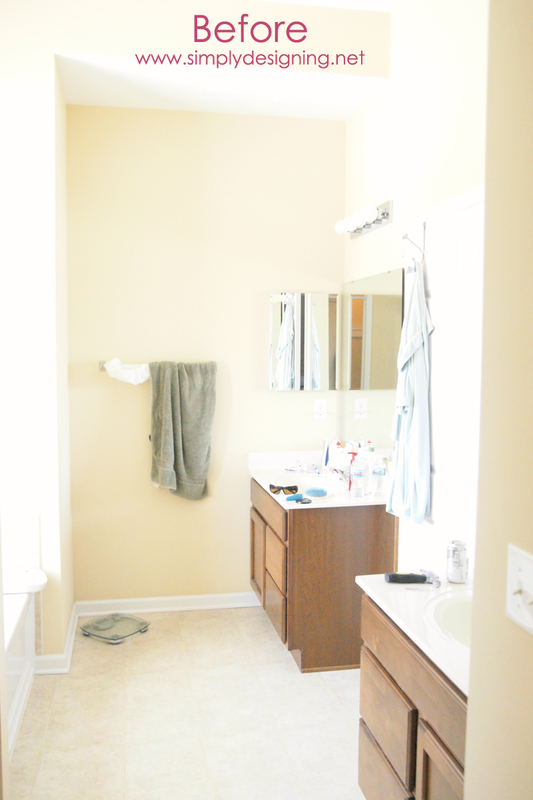 If your mirror is a different size you will need to change your cut sizes accordingly. It is always best to measure your own items to ensure the best fit. 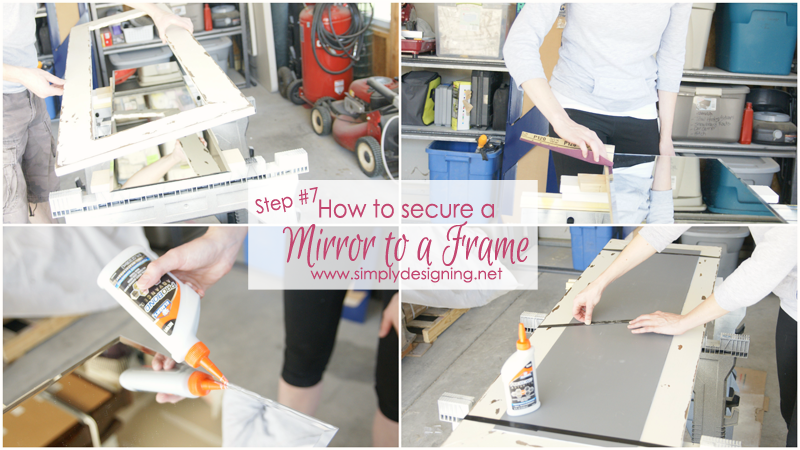 How to make a Framed Mirror with Hidden Jewelry Storage with steps and photos. 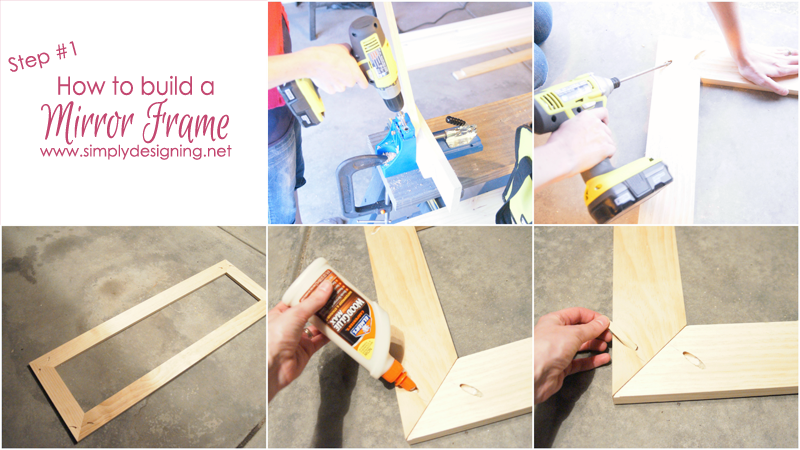 Use your Kreg Jig to drill one pocket holes into each of the ends of the wood. Set your collar and your pocket hole depth to 3/4″ since that is the actual thickness of the wood you are using. Secure your boards together in a frame shape using your Kreg Screws. You will either need a right-angle clamp to help hold these pieces of wood together while you screw them together or a second set of hands. You will want one screw going into one board, and one going into the other at each corner. This will create counter pressure and help secure the frame together very nicely and will help prevent warping or tweaking. Next, add a little Elmer’s Wood Glue into each of the pocket holes and insert a Kreg Wood Plug. These will probably extend a little bit beyond the opening. That’s ok because your next step is to sand your frame well using your electric sander! 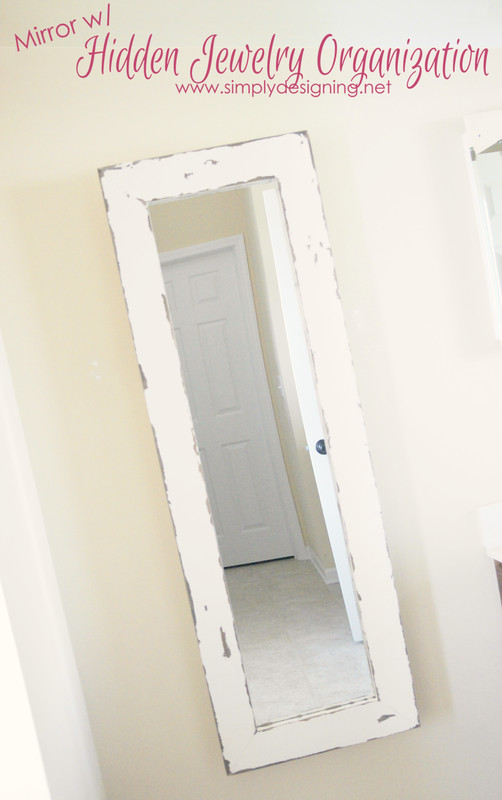 After you are done, you have built your Frame for the mirror with hidden jewelry storage!! Wahoo! 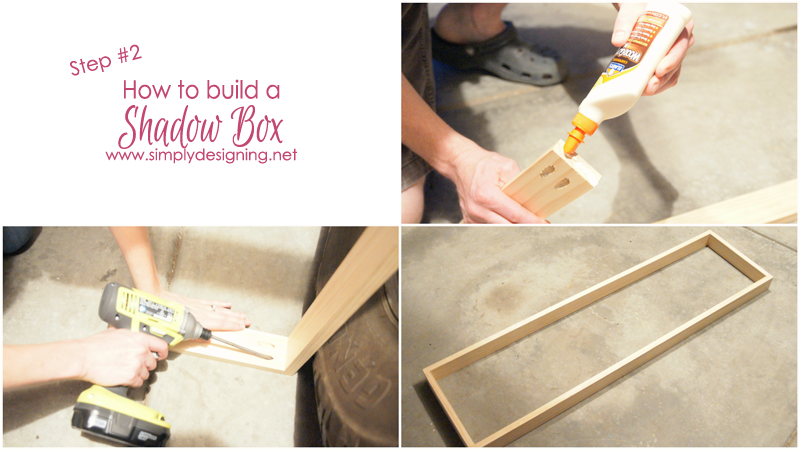 Your “shadow box” is the outside box of the jewelry organizer that will contain your jewelry. This is again really simple to build. Because of the size of my mirror and my metal, I wanted my inside dimensions to be 48″ x 12″ clear so that the mirror would sit slightly inside this shadow box and so that my decorative metal would sit nicely inside it too. Once that is complete, add a bit of Elmer’s Wood Glue into the holes and insert your Kreg Wood Plug into the opening. Finally, sand the shadow box really well. 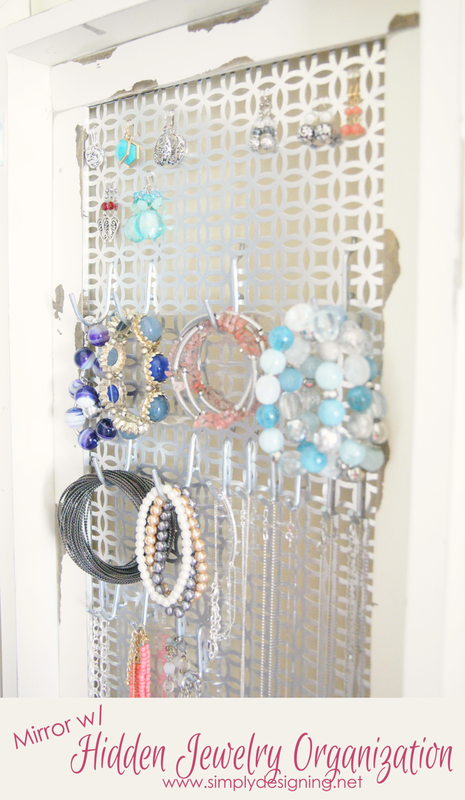 The trick to building a successful jewelry holder is having the decorative metal where your jewelry will hang from not be completely flush against the wall and also having enough room between the decorative metal and your framed mirror door so that there is room for your jewelry. Without buying an expensive router or getting too complicated, we decided that if we built a simple ledge on the inside back of the shadow box to adhere the metal too, it would give enough room behind it for hooks to be hung, and enough room in front of it to accommodate jewelry. If this doesn’t make sense now…it will soon! I promise! As you can see above, this ledge will sit INSIDE your shadow box. The inside of your shadow box should be 48″ x 12″ clear so these dimensions should fit snugly in there. But please please please measure before you cut as there is always a bit of variation in every build. Once you have the pieces cut, set them inside your shadowbox and nail gun the ledge to your shadow box. Super simple and easy step! You will have a frame around the inside edge PLUS one piece exactly in the middle. This middle piece is where your two pieces of metal will meet and you will want the extra support here for that. I love the chippy paint look but I have never done it before. So this was a bit of a leap in faith that I would love the DIY result. I based my method off of this tutorial here. First, you will use a rag to stain all of your pieces. You will stain the Mirror Frame, your Shadow Box with BBuilt-InLedge, and your Decorative Trim (which will eventually become an interior frame for your metal pieces.) Let it all dry. Then apply Vaseline anywhere where you want your paint to “chip” off of the item. The areas where you put Vaseline, the paint will not dry and you will be able to take the paint off to achieve a chippy look. So focus this on areas that would naturally receive wear like corners and edges, but do a few other random spots too. Don’t think too hard about this. The more random and sloppy the better the outcome! 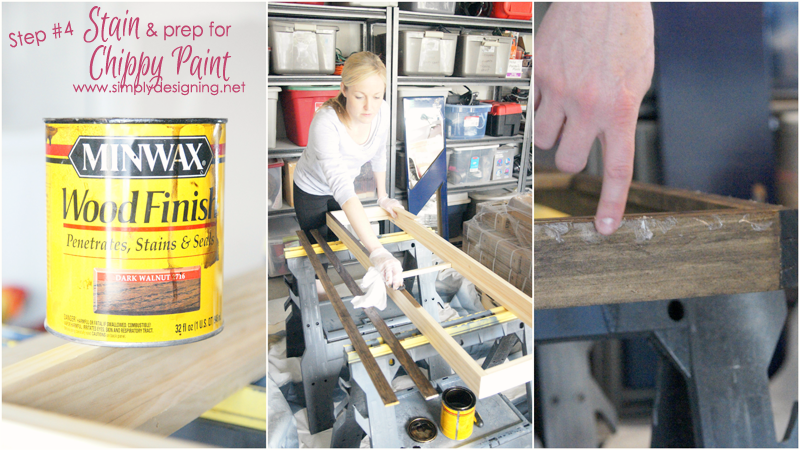 Because you just smeared Vaseline all over your wood pieces, you will need to spray your paint on! 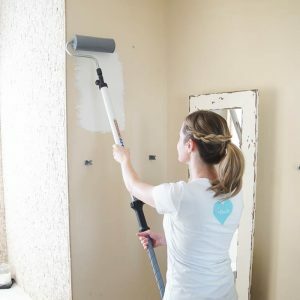 You can use spray paint or a spray gun, just don’t try to use a paintbrush! Liberally apply spray paint to all pieces. Coat the fronts and the backs and be sure that you do several coats. Let dry. Let me be real and honest here. 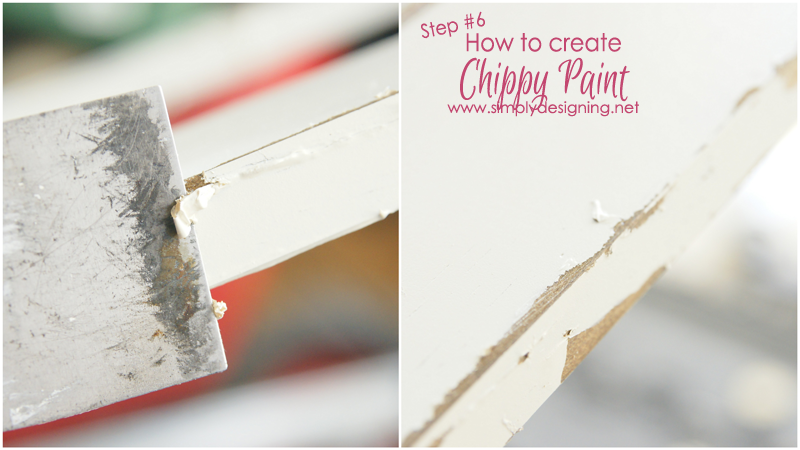 I was so excited about this whole chippy paint thing…until I started to actually scrape the paint off. Then, I was horrified! I thought I had made the biggest mistake ever! 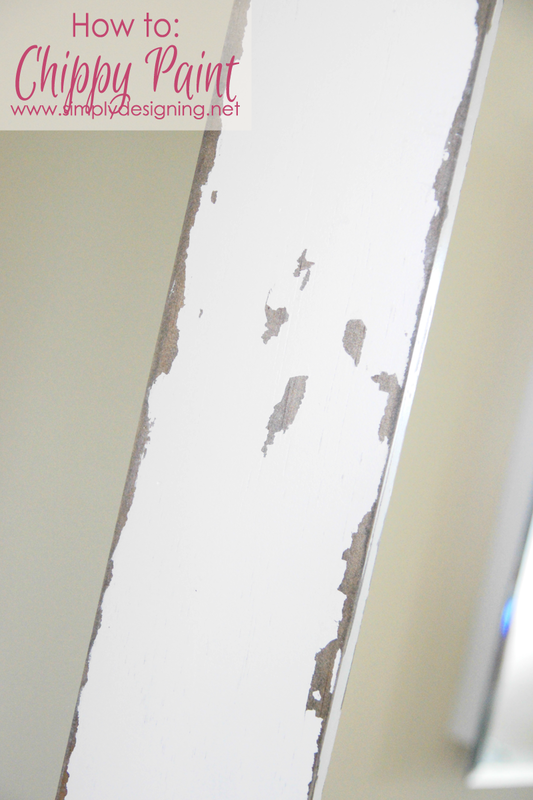 Here I had this clean, pristine painted wood, and I was literally scrapping chunks of it off! Yikes! But the more I scraped off, the more I simply fell in love with this and the more I knew this was the perfect finish for my home! And the more I look at it, the even deeper I fall in love with it! So the moral of the story is, this might be a horrifyingly scary step…but just keep going and it will turn out beautiful! Use your paint scrapper to scrape off the areas where the Vaseline has been placed. It comes off really easily, but leaves a greasy, sticky mess. So wipe your boards down with a paper towel and then a baby wipe to get any residue off. Then sand lightly with an electric sander for a bit more of a distressed look if you’d like. Isn’t that just perfection!? (In an imperfect way of course 🙂 The more I look at my final project, the more I LOVE my chippy paint look! Even though it was a bit scary for a minute there, I honestly, love it and will definitely do this technique again! After everything is to this point you are ready to begin assembling your project! Woot woot! You will want to follow the instructions on the back of the ProBond glue bottle, but here are the basics! You will want to sand all of your edges. I had just sanded my wood so I decided to give the edges of my mirror a quick sanding by hand. Next, you will apply a bead of the glue to your mirror. Then carefully set your frame on top of your mirror. I wanted to be sure that no glue ran onto my mirror, so once I knew it was ok, with a second set of hands we flipped the mirror and frame over so that the weight of the mirror would help secure it to the frame. You will want to hold the pieces of the mirror with hidden jewelry storage together in place for a few minutes. Again, a second set of hands is really helpful here! 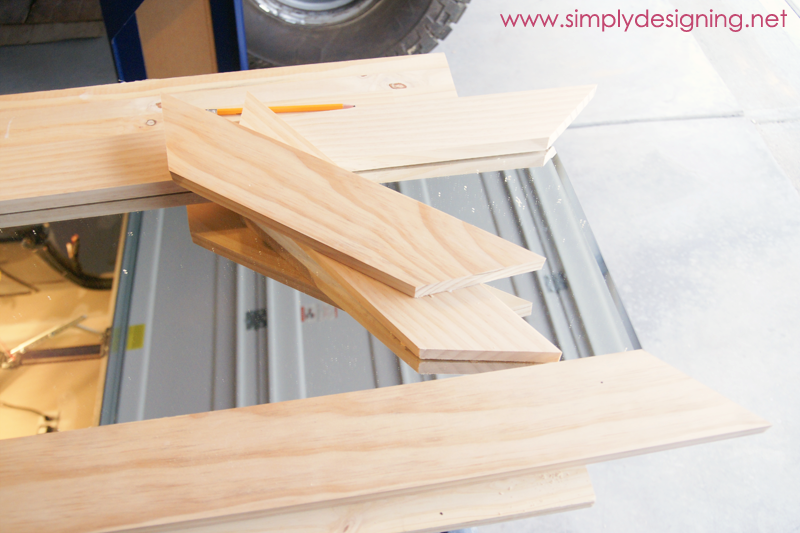 Then use Elmer’s Clamp Tape to secure the mirror to the frame and let it sit for several hours until completely set! Elmer’s ProBond takes about 2 hours to set, and up to 24 hours to completely harden. So be sure to allow enough time for this to set completely before moving on to the next step. ProBond is an amazing glue that allows you to bond porous surfaces to non-porous surfaces and other Mixed Materials. So something like wood to a mirror or wood to metal is a perfect example! And there is no foam residue. The longer the mirror set, the more worried I became! The last thing I wanted was a shattered mirror all over my garage. But I waited patiently until the glue was completely set, took the clamp tape off and amazingly, the mirror has solidly adhered to the frame! Seriously, this mirror isn’t going anywhere! It is so incredibly sturdy! Seriously, this stuff is one of my new favorite finds! 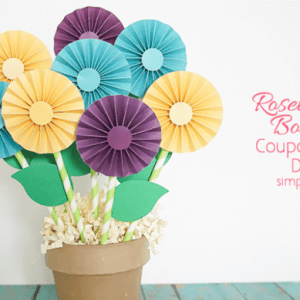 In this next step, you will attach your metal to the shadow box and prep your box to be hung. First, simply place your metal into your shadow box so that it sits on top of your ledge. If it doesn’t quite fit, you can use tin snips to trim the edges a bit. The two metal pieces should meet in the middle where your middle 1″x1″ support board is. Next, you will prep your box for hanging. Because this is a heavy item and you don’t want your jewelry to fall down every time you open and shut it, and because a mirror hanging at an angle can make you look distorted, you will want to screw this box directly into your wall. In order to prep this, use your drill to pre-drill holes through the metal and into the 1″x1″ ledge on the top and bottom of your shadow box. Place two holes in the top and two in the bottom. Next, you will use a bit of Elmer’s ProBond Glue to glue the Decorative Metal to the Ledge. Because of how this was built, I was not able to use Clamp Tape to hold this together, so I used painter’s tape around all of the edges and in the middle to secure this in place while it dried. First, place your drywall anchors if needed. This box is heavy, so unless you are securing this into a stud, you will want to use these! Then, using your pre-drilled holes on your shadow box, screw the screws into the shadow box ledge directly into the wall. Use your nail gun to attach your decorative pieces of wood on top of the metal. This will hide the screws that just went into the wall and create a beautiful frame around your metal hanging area and create a lovely finished look to your project! You could also use your ProBond Glue to attach this! Then carefully attach your hinges to the shadow box and secure the other side of the hinge into the frame. A second set of hands is very helpful for this! 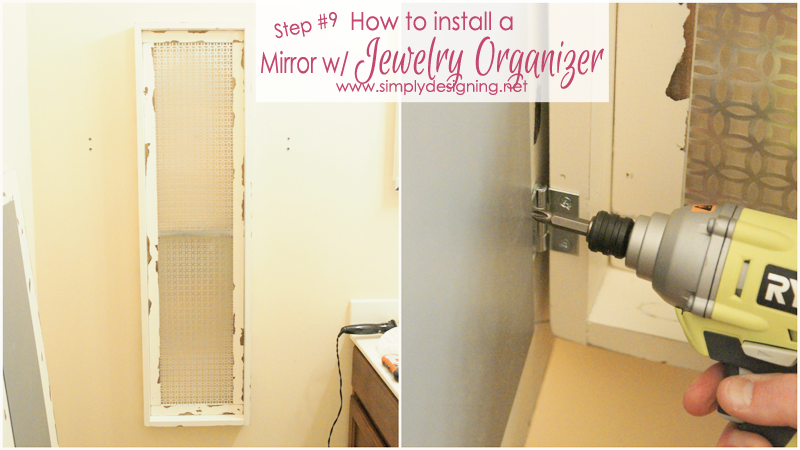 Attach a magnetic closure and you are done building your mirror with hidden jewelry storage! I know there are a lot of steps, but this is honestly a simple and fun build! I love how my DIY framed mirror with hidden jewelry storage fulfills two needs with only using one wall! I now have a full-length mirror AND a place to store all my jewelry!! You have no idea how happy this makes me! 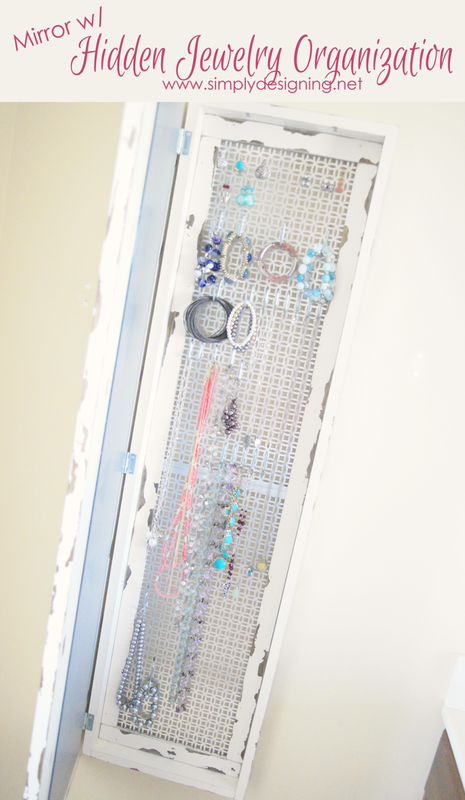 I used pegboard hooks to hang all of my jewelry from which is perfect because I am able to customize my mirror with hidden jewelry storage any way I need to depending on the size and shape of my jewelry. If you like this mirror with hidden jewelry storage, I would love for you to take a moment to PIN IT for me! Thanks! 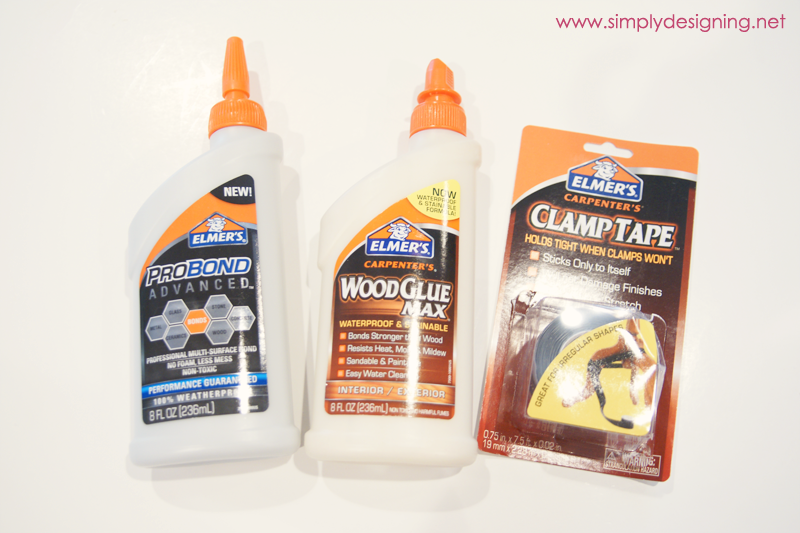 How would YOU use Elmer’s ProBond Advanced? Wow this is awesome Ashley, are you sure you don&#39;t want to come to my house and build one for me? Love this! I have a little one but it is so stuffed it will barely close. Maybe I need to make a big one! OK, WOW. Just WOW. You are totally my new hero Ashley. I LOVE this project. I may have to make one this summer! PINNED! Oh thank you so much Jennifer! You are the sweetest! You should definitely make on this summer! Thanks so much for pinning! This is amazing! I just finished my own jewelry organizer and now wish I had thought of something like this! Thank you Kelly! Oh I can&#39;t wait to go and see yours too! Thanks so much for stopping by! Super cool! 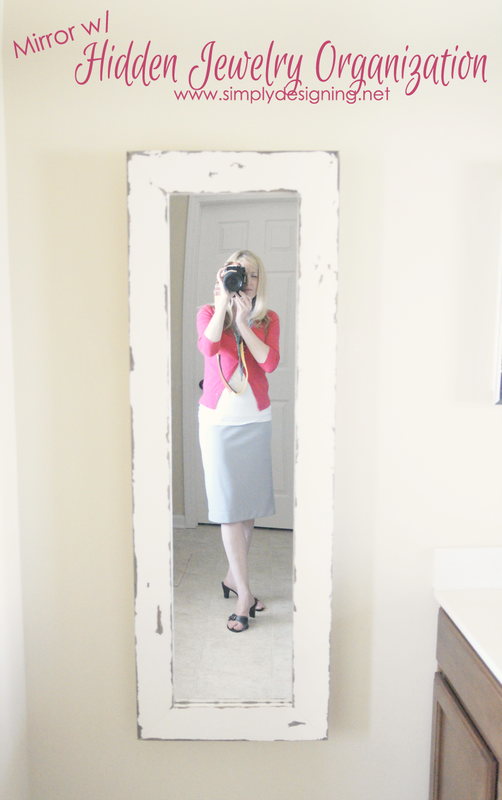 The mirror with the chippy frame looks gorgeous – throw in the hidden jewelry and it is amazing! Thank you so much Carrie! You are so sweet 🙂 Thanks for stopping by! Love it! It&#39;s a great addition and I need extra jewelry storage! Thank you so much!! And thanks for stopping by! Kristi you are too sweet 🙂 You are absolutely beautiful too! You definitely need to get your hands on an AirStrike! They are amazing! Brillliant! I so need to organize my jewelry. Pinning this for future ideas. Thanks! Wow, that is one beautiful jewelry organizer! I love that it doesn&#39;t take up floor/counter space! Oh thank you so much! And thanks for stopping by! I love this idea, it&#39;s so clever!!! Thank you Jessi! You are so sweet. love it! My only suggestion is that you shouldn&#39;t store your jewelry in your bathroom. 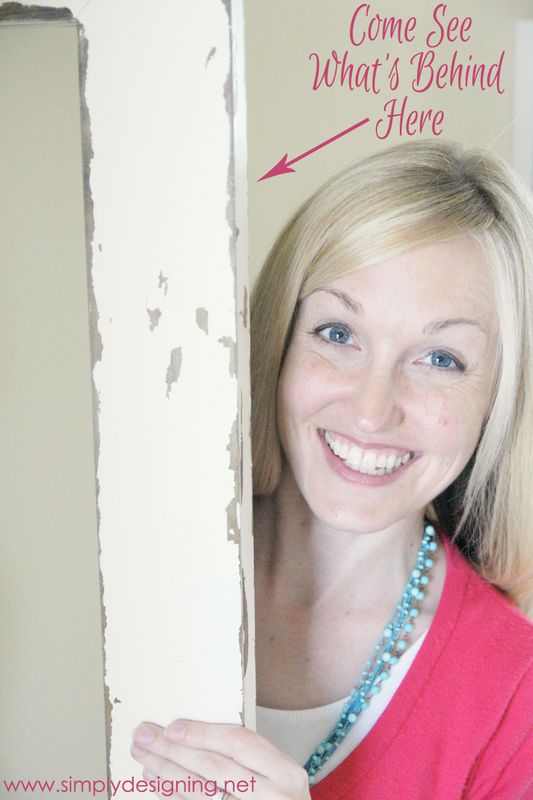 I sell a line of jewelry thru home shows…and we try to teach that moisture = bad for your jewelry. It will make your silver jewelry tarnish quicker! LOVE the idea though! This is such a great idea. My jewelry is absolutely everywhere in the house right now. Marie you are so sweet!! I am so glad that this gave you a good idea! Thanks so much for stopping by! I can&#39;t wait to see what you come up with! Great tutorial for a something that we could all use. Pinned. Thanks for sharing. This is beautiful Ashley! I can’t wait to make one! Where did you get the decorative metal sheet? Hi Jen! Thanks so much! I found the metal sheet at Hobby Lobby actually! But I seen similar things at other craft stores too.